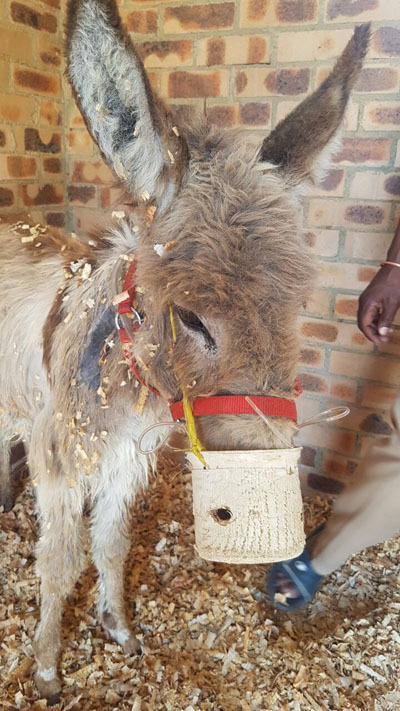 A little 8 month old donkey was referred to the clinic as it had become depressed and lethargic and had not passed any droppings in the past two days. 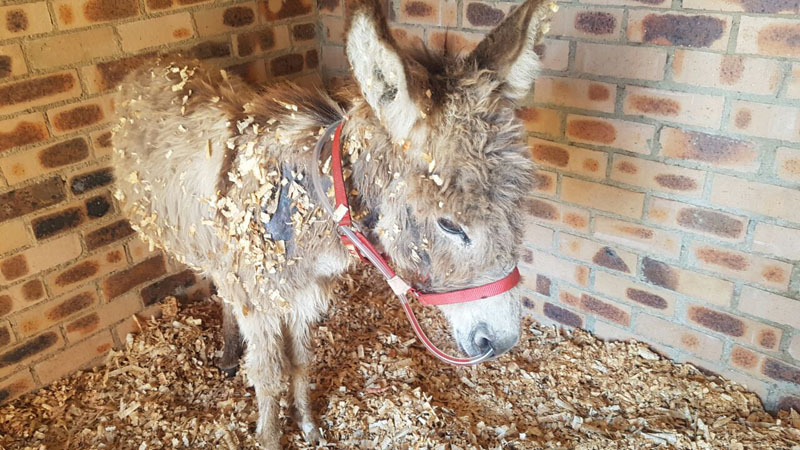 Upon speaking to the owners we discovered that they had dipped the donkey in order to treat a skin condition using a cattle dip product which contained the active ingredient “Amitraz”. This immediately raised a red flag as Amitraz is toxic to equids (as well as cats and Chihuahuas!). 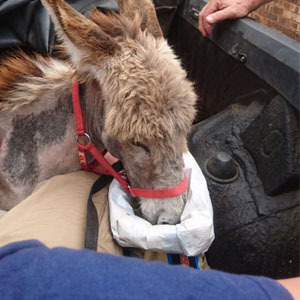 The donkey was found to be clinically depressed and lethargic on arrival. She had a slow mucous membrane capillary refill time, as well as a slightly slow skin tent response. These two clinical signs pointed to the probability that the donkey was somewhat dehydrated. 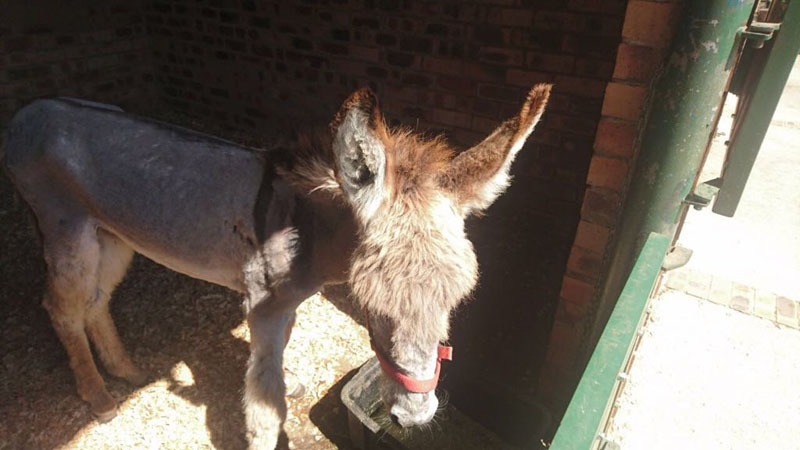 The donkey also had a bloated appearance to her abdomen. She was immediately bathed using cold water (the cold water helps to cause constriction of the blood vessels to the skin) which aids in preventing/delaying the rate of absorption of the toxic product through the skin. Amitraz causes gut stasis i.e. a slowing down or inactivity of the gut. When the abdomen was auscultated for gut sounds they were absent or had prolonged periods between gut sounds (and if they did occur they were weak, non-progressive sounds). She was too small to have a rectal examination performed but if we were are able to do one, we would have found an impaction of the large colon. The extent and hardness of the impaction often varies but generally involves the greater portion of the large colon. Horses can remain impacted for an extended period of time and may become surgical candidates should the impaction not be resolved and gas accumulation and bloating occurs. Unfortunately there is no safe, “recognized” reversal drug for Amitraz toxicity. Treatment involves keeping the patient hydrated – this may be via oral fluids (through the use of nasogastric tubing) or by intravenous fluid administration. Thankfully she was not refluxing and was able to tolerate the placement of an indwelling nasogastric tube. She was given small amounts of fluids frequently and was starved during this time. She was given electrolytes and dextrose via the oral fluids in order to keep her strength up. She passed two tiny mucous covered dropping balls in the first evening after admission to the clinic. It took a further 3 full days of fluid therapy (and patience) before she finally began to pass normal, large piles of droppings. Food was very slowly reintroduced to her and she tolerated this well. She received a welcomed makeover prior to discharge and has been doing well since! It is important to CHECK and ADHERE to all product recommendations prior to use in any equines. Horses are not “small cattle” and are far more sensitive to drugs than many of the other large animals. Even if a product has been commonly used in horses, despite not being registered for use in this species, negative side effects are commonly encountered and there is no legal recourse should something go wrong.